He's T-Pain, and now you can be too. Remember we told you a while back that T-Pain was working on a version of Auto-Tune for the iPhone? Well, now he's gone and released it. Developed by Smule (of Ocarina fame) but featuring technology from Antares, I Am T-Pain enables you to get the now notorious 'extreme Auto-Tune sound' on your iPhone (there's currently no iPod touch version) for just £1.79/$2.99. The app ships with several T-Pain tracks for you to sing along to (via the internal mic or the one on the iPhone headphones), and you can buy more from within it. Your songs can be recorded and published to FaceBook or MySpace. You can also use the app without a backing track, which presumably makes it possible to have an Auto-Tuned conversation with someone (Kanye West perhaps?). Oh, and if you plug your iPhone's audio output into some speakers, everyone can hear your robotised voice, which is nice for them. 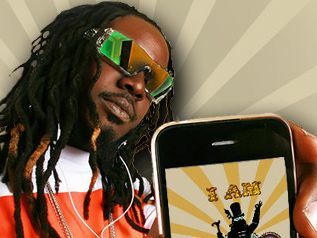 Check out the videos below to see I Am T-Pain in action; it's available now from the Apple App Store.